Hi folks! My son recently had a birthday and we decorated for his special day with glow-in-the-dark party supplies. 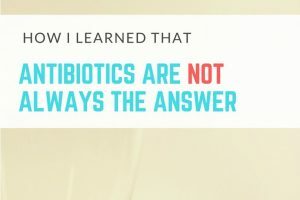 This idea came to me as I was perusing the aisles at Walmart trying to figure a way to decorate for a 12 year old with being too cheezy or un-cool (anyone else been there?). During Halloween time, my Walmart has a huge section of glowing decorations and favors. Although it was only a family party this year, I wanted his day to still be awesome. 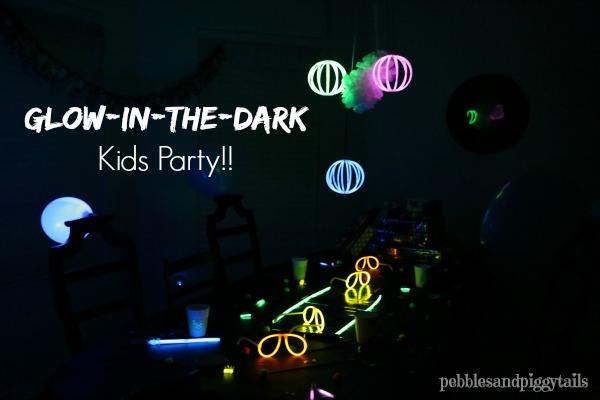 Decorating with glow in the dark supplies was a cinch and a great surprise! 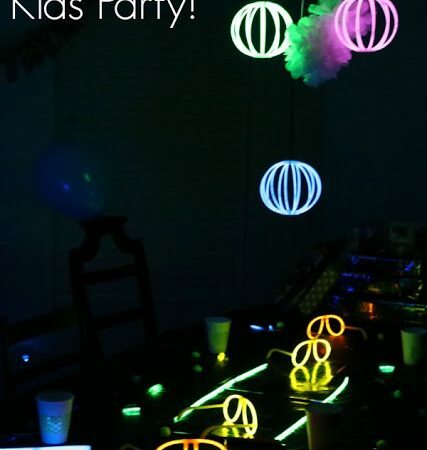 Of course this glow in the dark party idea works best for night time or early morning celebrations. 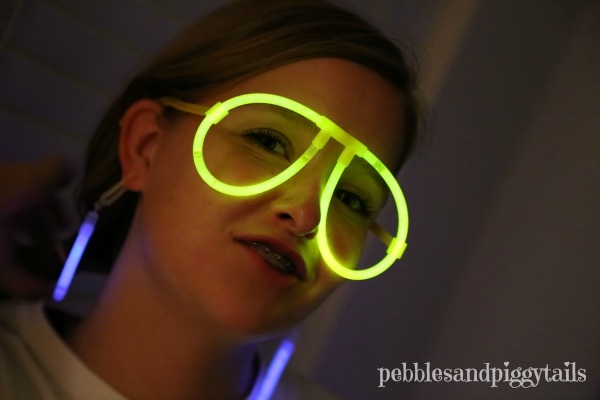 Have I ever mentioned that I kinda really LOVE glow sticks? 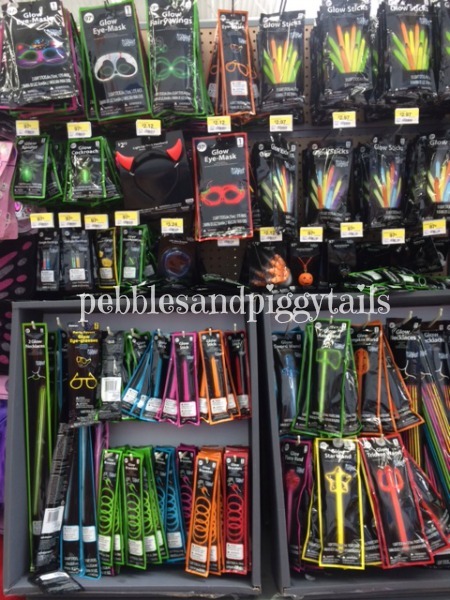 Here’s the pic I took of the HUGE section of glow-in-the-dark toys, decorations, and supplies at Walmart. I found this in the Halloween section, but they also had glow stuff in the birthday party section. My most favorite item were these Glow Lanterns. 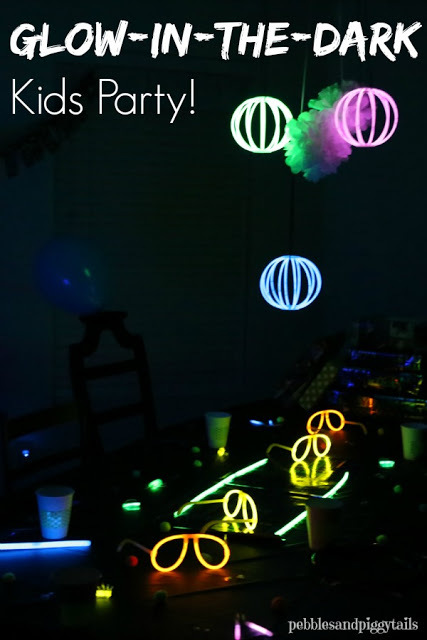 Totally fun way to decorate (and they pretty much are reusable if you hold onto that little base and refill with glow sticks. 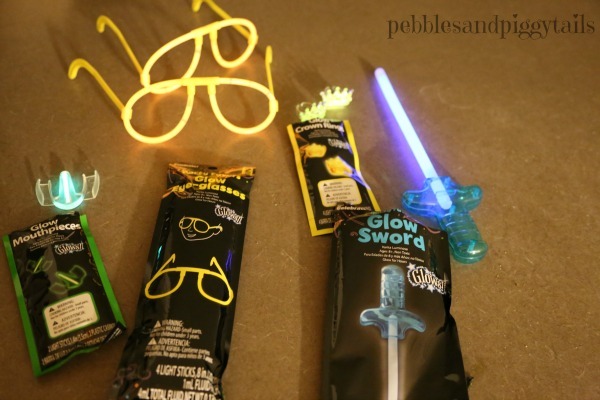 These are some other fun glowing items. 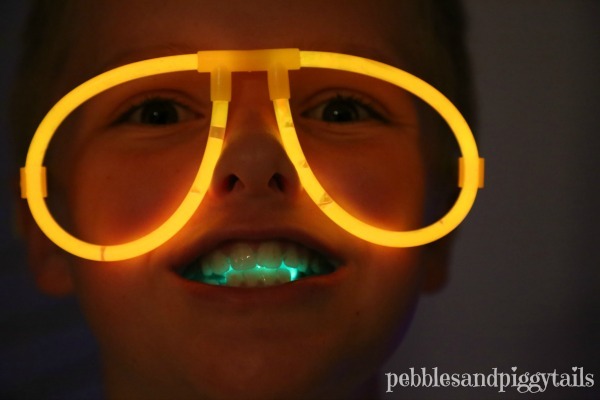 Glow glasses, glow sword, glow rings, and cool glow mouthpieces that make your mouth look all lit up! My girls loved the glow earrings and my son liked the glowing cockroach (eww!). An that BIG glow stick you see there? I stuck that in the middle of the table and it really lit up the area. 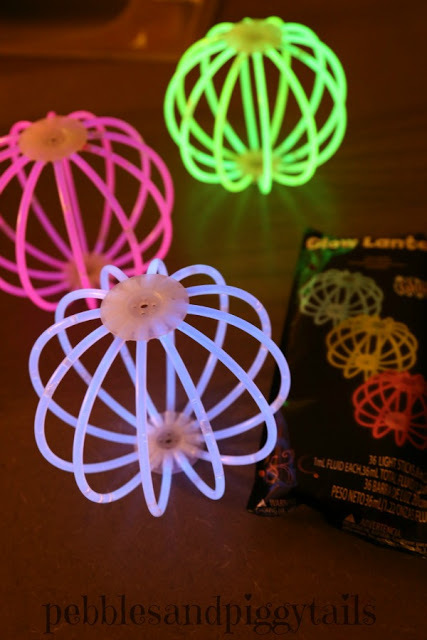 These Light Up Balloons are pretty neat too. 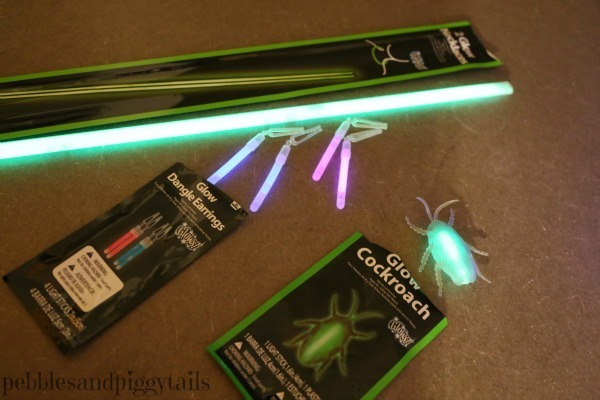 They glow longer than the glow sticks, but they only come in a pack of ONE. My Man and I actually woke up super early in the morning and set all this up so my son would wake up to a glowing kitchen. Little Son is an early bird and is always the first one awake. We thought this would be a cool way to surprise him, especially because it’s still very dark in the morning when he gets up. I decorated the table with black party goods. Black table cloth, black paper plates, etc. Then I put glow-in-the-dark tape that I already had on-hand on the paper cups just for fun. 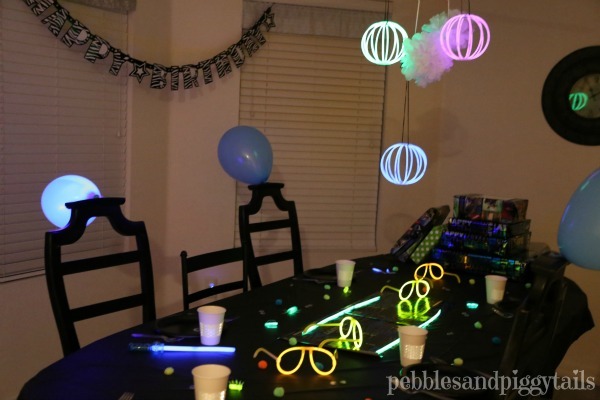 I spread around googly eyes and neon fuzz balls as table scatter and then stuck all the glowy stuff everywhere. 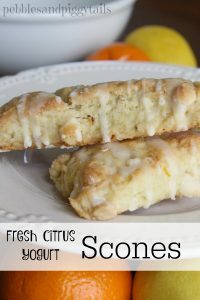 I gotta say this was a super fun surprise for all my kids when they woke up! We ate a birthday breakfast in the dark together covered in glow sticks. Good times. 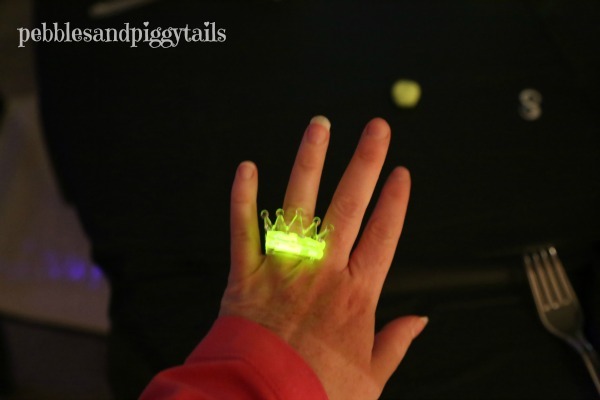 Behold the glowing crown ring . 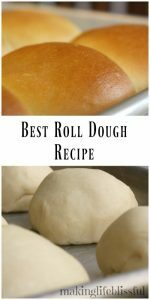 . .
(I don’t recommend this one for littles). Everyone needs a pair of glowing earrings, I say. Anyway, just a fun and simple way to surprise your kids. 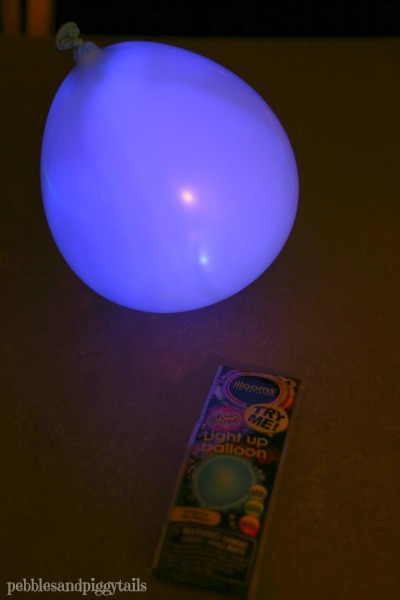 Below are some fun glow-in-the-dark games and party ideas . . .